IBASSIN: 2017 BASS Elite Lake Dardanelle Day 3: Mark Davis Leads by Ounces with 48-08lbs! 2017 BASS Elite Lake Dardanelle Day 3: Mark Davis Leads by Ounces with 48-08lbs! Davis found a honey hole way, way up the river. Mark has tiny side channel to himself up the river. Mark Davis of Mount Ida, Ark., caught a five-bass limit that weighed 14 pounds, 15 ounces during today’s semi-final round to maintain his lead at the GoPro Bassmaster Elite at Lake Dardanelle presented by Econo Lodge. With $100,000 on the line for Monday's champion, Davis still thinks 16 to 17 pounds will be required to win. He’s averaging just over 16 pounds with a three-day total of 48-8. Davis’ spot did receive some additional local pressure before he could get there, and that certainly could be contributing to the reduced action during Sunday’s competition. “I have no problem sharing water with local anglers, heck they’ve got just as much right to fish there as I do — if not more so,” he said. “When I arrived he moved off and let me have it, which was appreciated. He said it’s unfortunate that his spot is so isolated, but that’s likely why other Elite Series anglers haven’t been fishing it. Davis plans to fish there until about 9 a.m. before relocating down the lake. New York resident and Bassmaster Elite Series rookie Jamie Hartman is just 9 ounces behind Davis. He caught 16-6 today pushing his total to 47-15. 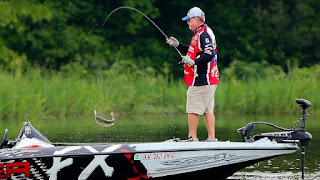 He has finished in the Top 12 three times during his first season as an Elite Series pro, second at Cherokee Lake, third at Toledo Bend and will begin Championship Monday on Dardanelle in third place. Hartman has not been fishing conservatively this week, but he also hasn’t been getting many bites.Friday he caught seven keepers, six on Saturday and seven again today. 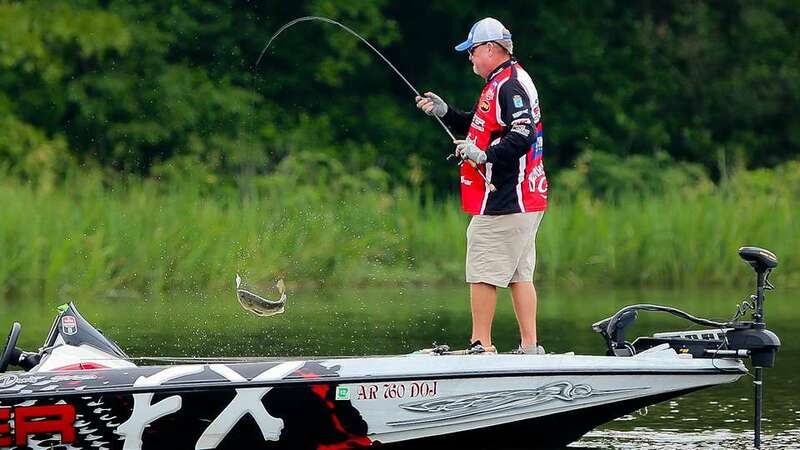 Rounding out the Top 12 include: Steve Kennedy (47-3), Michael Iaconelli (45-13), Dean Rojas (45-13), David Mullins (44-14), Kevin VanDam (43-11), Brandon Palaniuk (43-2), Mark Menendez (42-12), Cliff Pace (42-8), Cliff Prince (42-8) and Matt Lee (42-6). David Mullins of Mount Carmel, Tenn., is still leading the Phoenix Boats Big Bass Award thanks to a 6-pound, 8-ounce largemouth he caught on Friday. Championship Monday will begin with takeoff at 6:15 a.m. CT at Lake Dardanelle State Park, and weigh-in will be in the same location at 3:15 p.m. The event is hosted by the Russellville Advertising and Promotion Commission.